I am a fan of oranges and strawberries together. It must not be a trendy combination at the moment because I don’t feel like I see orange strawberry things too often these days. Loaded up with fresh strawberries from my local farmer’s market, I decided to experiment a little bit one day to create a summery strawberry orange drink – and the result was this Ice Blended Orange Strawberry Refresher. 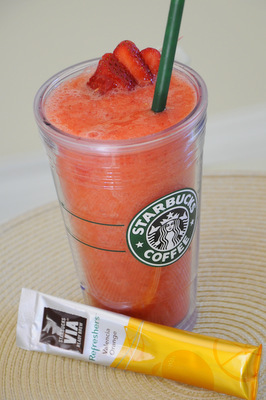 I combined fresh strawberries, ice and a packet of Starbucks Valencia Orange VIA Refresher in the blender, along with some water and orange juice. The Valencia Orange Via has a nice sweetness to it and a bright orange flavor. In this particular drink, I liked the added energy boost from the green coffee extract along with the fruit flavors. The Via can be a little too sweet if you don’t add the appropriate amount of water to it, which is why I opted for a blend of water and fresh orange juice to blend up the berries and ice. This drink recipe will serve two, although with smaller glasses you can easily stretch it to serve four. It doesn’t look like Starbucks will be offering blended Refreshers drinks anytime soon, but maybe a drink like this one will inspire them. The strawberry orange combination was sweet, zesty and refreshing – a drink to relax with on a hot summer afternoon. In a blender, combine strawberries, ice, VIA, water and orange juice. Blend at low speed for about 30 seconds to break up the ice, then blend at high speed for at least a minute, until the ingredients are very well blended and all of the VIA has been incorporated. If the mixture is too thick, add in an extra few tablespoons of water to thin it out slightly.